It’s been awhile, huh? What, like five months? So you can imagine what happens when I get busy. Nate and I got engaged! I’m stopping school after I get my Master’s this summer. It’s a long story. Yeah. Other stuff happened too, but those are the big things. I’ll try to be better, I promise! So remember way back on the first of May when I promised I’d post these things at least once a week? And remember those 4-ish weeks in between then and now during which I posted exactly 0 blogs? Well, I have an excuse for the initial delay: I wanted to wait until I got back from my road trip with Nate so that I could post all of the trip-related blogs together. So there you go. I promise to adhere to that “at least once a week” promise now. Sorry, guys. The more I try to be better about posting, the worse I seem to get. Also, thanks both to the official Scrabble dictionary and the fact that “quixotic” is apparently pronounced like it’s spelled and not like kee-YHO-tik, I have lost faith in the English language. About time I uploaded these, eh? Sorry, y’all. I’ve been super busy with school. I’m used to UI’s 15-week semesters, not Canada’s 12-week ones. It gets crazy at the end. I know it’s not an excuse, but there ya go. I think it’s time to bring back Ridin’ Ritz Man. Finally updated my “About” page to reflect the changes that have occurred over the past few months. Also, I basically condensed 23 complete pages of notes onto 1 side of a 8.5”x11” sheet of paper for my midterm, ‘cause of my MINISCULE HANDWRITING! 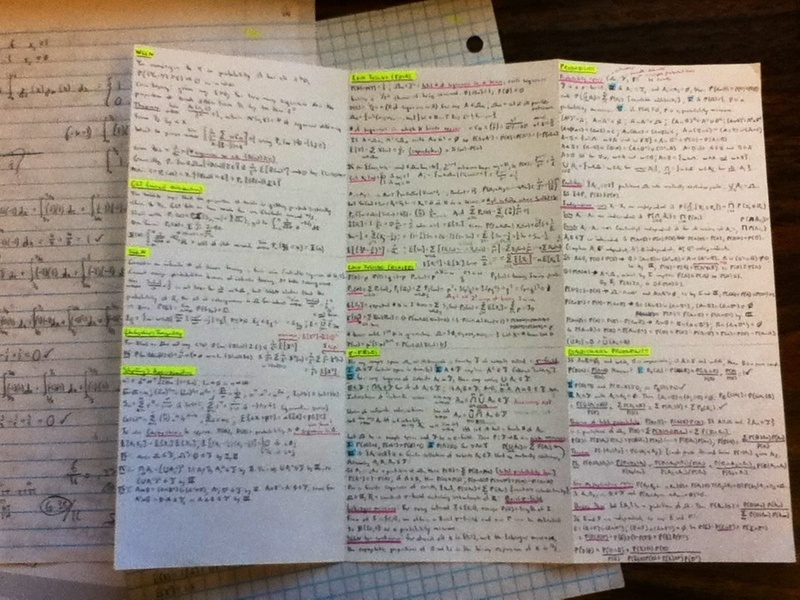 I always like it when professors allow “cheat sheets” on exams, mainly because by the time I’ve made the final version, I’ve written everything down so many times that I don’t even need the sheet on the test. Which is probably half the point of making a cheat sheet anyway. GOD I’M A BAD PERSON. I’m really sorry, guys. I just mass-posted 32 pages worth of blog and probably annoyed the crap out of any subscribers. Totally understand if you want to unsubscribe. Anyway. School + work + joy of teaching stats kind of took over my life. I’d write my blog for the day and then I’d be like “oh, internet!” and get distracted enough that by the time I realized I hadn’t actually posted yet I’d think “bah, too late, must sleep,” so I’d stick it in a Word document. Will a guy riding a Ritz cracker make up for it? Haha! I finally did it. Now read them, or this was all in vain. Alrighty then. This time it’s for real. ALL BLOGS FROM THIS DATE UP UNTIL JANUARY 6TH HAVE BEEN WRITTEN ON THEIR RESPECTIVE DATES. Have fun with this when it’s done…a month’s amount of blogs, plus some! Huttah!